5CA decided their existing Quality Assessment solution was too rigid to accommodate the myriad changes in their business. 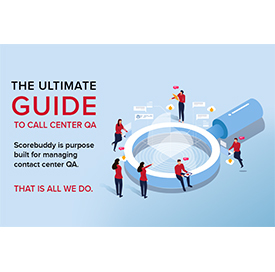 5CA has a keen focus on QA, and uses Scorebuddy as their QA tool. Contact centres have long accepted discrepancies between forecasts and actual staffing needs as a reality of the industry. 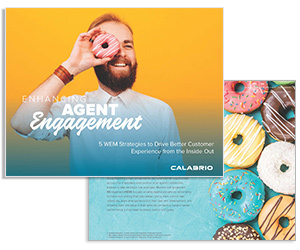 This report shares how with NICE EEM, contact centres can unlock the ability to optimise staffing, reduce attrition and achieve operational efficiency. Looking for an independent assessment of the leading cloud contact centre vendors? Forrester Research has evaluated the main players for you, with Serenova highlighted as a Strong Performer. With renewed focus on Artificial intelligence applications for business, this report shares how with NICE WFM, the machine takes on the tasks of learning each environment and applying intelligence that exceeds the human capacity to process. Why digital self-service without true omnichannel strategies risks the entire customer experience. New study reveals that companies must first focus on themselves to meet customer expectations for digital service. Fraud is on the rise across customer-facing interaction channels. This white paper examines the challenges that organisations face and how voice, behavioural and biometrics successfully detect and prevent fraud while improving customer experience by reducing effort for legitimate customers. Studies have shown that it’s emotional satisfaction that is especially important. This white paper looks at emotions, how they influence behaviour, their relevance to customer experience outcomes and specifically how all this translates into the daily life of customer interaction. Forward-thinking contact centre leaders recognise the potential value of voice of the customer data.. What does it take to truly harness your customer data and become a voice of the customer superhero? Download the ebook to find out. Call centres are expected to continuously improve the customer experience. Today, they are expected to reduce costs too. This case study illustrates how Real Time Resolutions successfully implemented Interaction Analytics to significantly reduce costs and increase customer contact. Is your contact centre prepared to stop current customer churn and adapt to take on future challenges? Get the ebook to find out how to use your customer interaction data to claim your spot at the executive table. Analytics is one of the more versatile and powerful innovations that has become available to contact centres. This white paper explains how interaction analytics creates value and rapid ROI with examples from real-world deployments. How to bridge silos for a better customer experience. In this guide, you’ll learn how to transcend the IVR-to-digital gap and move the right callers to the right digital channels so you can enhance the customer experience while cutting costs. This Customer Experience (CX) Transformation Benchmark reports on some of the most recent customer service experiences across 11 different channels.